Kathleen Petyarre was born around 1940 and is the sister of the well-known Gloria Petyarre and artists Ada Bird Petyarre, Violet Petyarre, Myrtle Petyarre, Jeannie Petyarre and Nancy Petyarre. Kathleen's main dreaming is about the Thorny Mountain Devil Lizard (Moloch Horridus). It is a unique lizard that grows up to 20 centimeters (8 inches) in length and can live up to 20 years. It is coloured in camouflaging shades of desert browns and tans that change from pale colours when warm to dark colours when cold. The species is entirely covered with conical spines. The Mountain Devil Lizard is not only impressive in its physical appearance but has a deep Aboriginal spirituality as it is the ancestral totem for Kathleen Petyarre and her sisters. They inherited the Mountain Devil Lizard (Arnkerrth) from their paternal grandmother and are the custodians of this significant Dreaming. It is their obligation to maintain this Aboriginal Dreamtime story and pass it on to future generations. To honour this Dreaming the Petyarre sisters each portray a different artistic interpretation of Mountain Devil Lizard Dreaming. 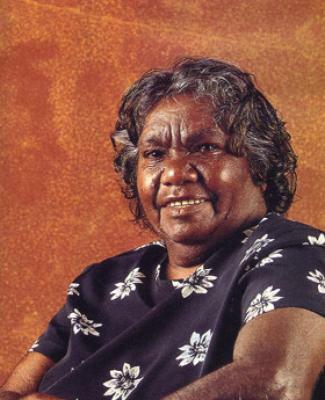 Kathleen Petyarre represents the epic journey of the Mountain Devil Lizard Dreaming (Arnkerrth) as it travelled across her traditional country (Atnangker).